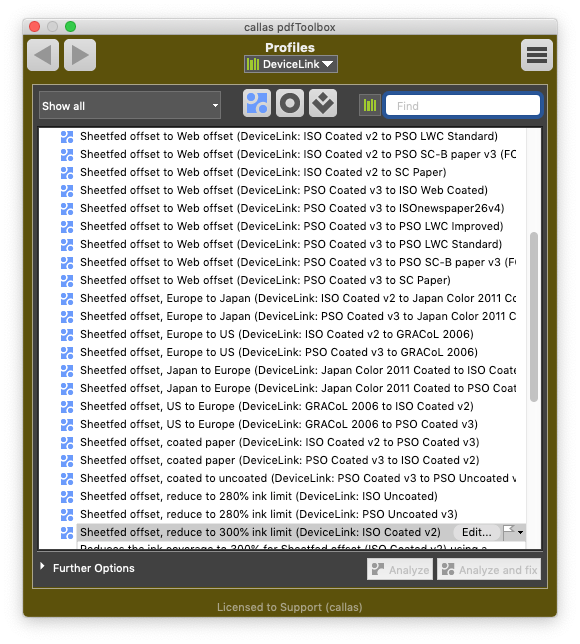 DeviceLink Profiles complement the use of standard ICC Profiles, countering the weaknesses (for certain purposes) of color conversion based on ICC Profiles. These weaknesses primarily involve CMYK-CMYK transformation and generally lead to loss of data relating to black generation and the number (and configuration/purity) of color channels used. A CMYK-CMYK transformation using ICC Profiles, however, always uses the device-independent lab color space, which leads to complete re-separation of the data and sometimes to unexpected and undesirable results. 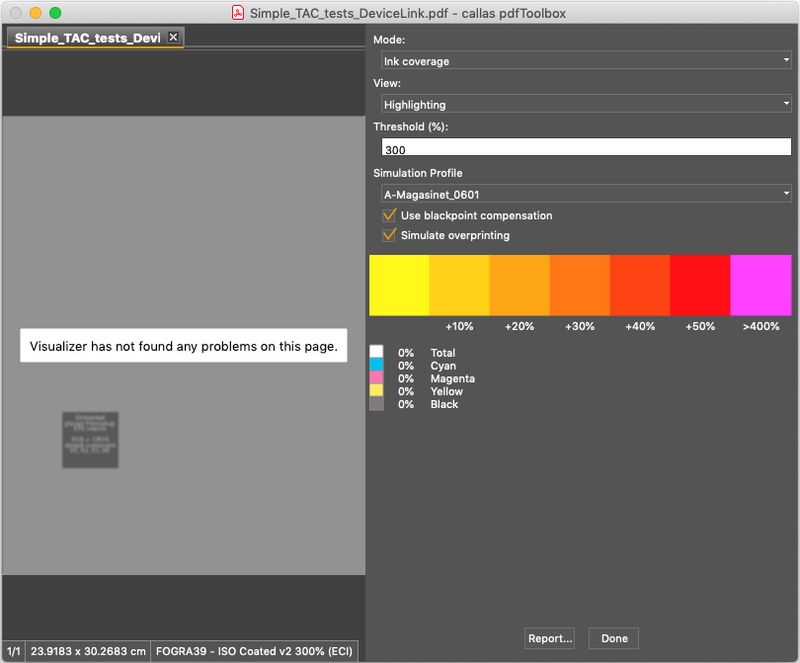 DeviceLink Profiles prevent this outcome: they allow direct control of the color composition without the extra work of using an intermediate color space. There are also DeviceLink Profiles with differing source and target color spaces. The callas DeviceLink add-on includes a set of the most commonly used DeviceLink Profiles. However, you can also install your own DeviceLink Profiles. More on this issue can be found in this chapter. You can very easily use your own Profiles for DeviceLink conversion with the pdfToolbox. Simply click on the “Import” button in the DeviceLink Action or in the “Convert colors with DeviceLink Profiles” Fixup, then select a Profile from your system. An XML file with descriptive text and a PNG file with the icon (all three with identical names, differing only by the file extension) will be automatically generated. These can be customized according to your exact needs. Please note that Profiles must end with the “icc” file extension in order to be imported. If you make any changes to the XML file, make sure to save it in UTF-8 format. You can also create different sets of descriptive text for different languages: simply copy the area designated “ENU” and mark it with e.g. “DEU”. If only the “ENU” section exists, it will be used for all languages. The PNG file should be 64x64 pixels in size. It is only used in the Switchboard and only needs to be changed if you wish to use your own icon. You can easily select and import DeviceLink Profiles using the “Import” button. The Profile will then be stored in your user preferences (in the current library from Version 9 onwards). The pdfToolbox is supplied with a range of DeviceLink conversions as standard. From Version 9 onwards, these can be found in the “DeviceLink” library. An add-on license is required in order to use these Fixups. No add-on license is required to use your own DeviceLink Profiles with the pdfToolbox. To use your own DeviceLink Profiles, simply create a new Fixup. 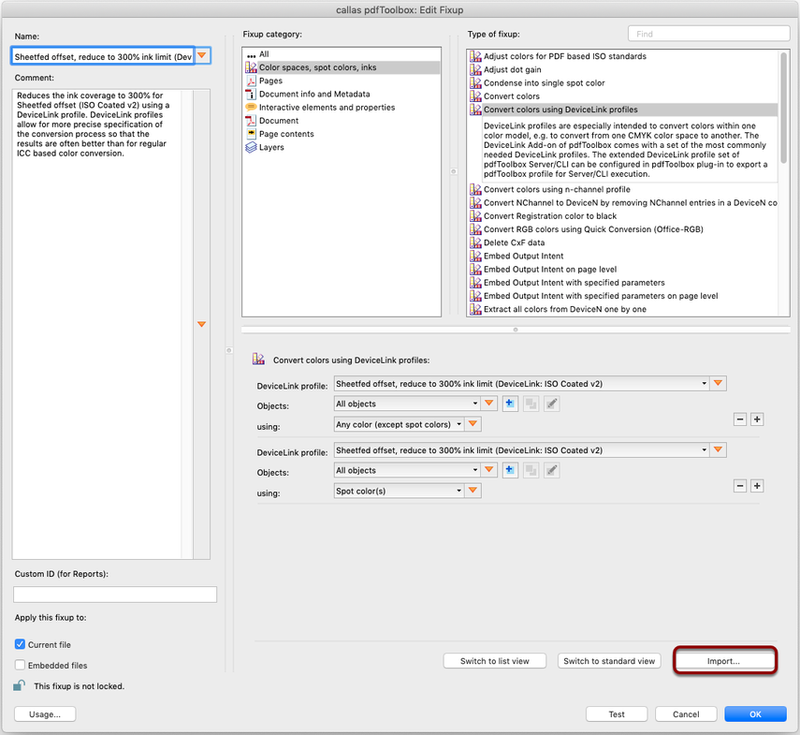 Alternately, you can edit existing Fixups and create duplicates in order to e.g. produce variants depending on the objects to be converted. To import your own DeviceLink Profiles, simply click on the “Import” button. The input file’s color limit is over 300%. 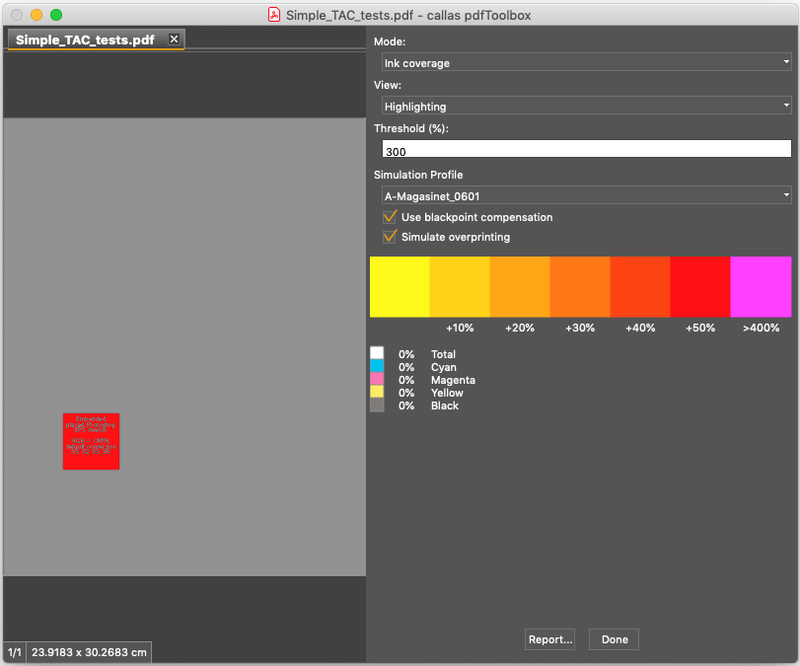 This can be visualized in the standalone version using the “Highlight total color limit” tool in the “View” menu. 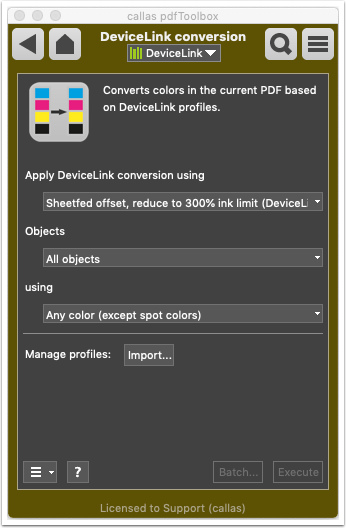 After applying the Fixup named “Convert colors using DeviceLink sheetfed offset, reduce to 300% ink limit (ISO)”, the output file has a color limit below 300%.